LoadKaro Dot Com is a Noida, Uttar Pradesh based company offering transport and logistics aggregator through their eCommerce website for Indian Transport sector. LoadKaro.com has been established with the vision to use technology in standardization of Indian transport and logistics industry. Now transporters and business owners can get benefit of this platform to secure their needs of transportation and loads. The company has also introduced a scheme of Tatkal Load for instant pickup and delivery services for businesses. 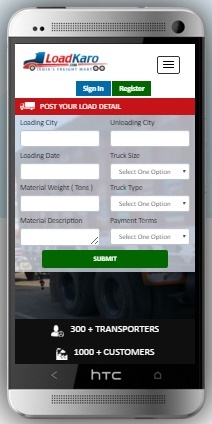 Business Owners / Customers or Transporters can register on the LoadKaro Online Truck Booking website or android app. After registration one need to login into the account and post a load or transport requirement. It is followed by the bidding or quotation by various transport companies for your requirement. You can wait and negotiate with the transporters. You can opt for the best option or quotation for your transport requirement. Finalize the deal and ask the transporter to pick up the load as per schedule date and time and time bound delivery. Similarly transport companies after registration can either post their truck / lorries or quote for the transport requirements of business owners. Load Karo Dot Com has also created the online smart phone app for the transport solutions and online truck booking one the go through your android smartphone. The transport webportal loadkaro.com has been widely covered by the media for its unique initiative and transport solutions for business owners and transporters. LoadKaro Blog is an important section of the eCommerce platform which keep you update about the latest trends and happening in the trucking and transport industry. Whats new and upcoming challenges of the logistics sector are being updated their. You can sign or register on this platform and as per their claim can be part of 300+ transporters, 1000+ customers and 2000 jobs. LoadKaro.com -- Aaj hi load karo - India's freight mart - A Truck Rental Platform is powered by IS Global Web. Get in touch with Load Karo??? Book online truck, Logistics Services, loading tempo for moving & goods transportation delhi to kolkata cont drict onwer mo 8789167294.